It takes a lot to ensure your business runs smoothly—a lot more than what customers and passers-by can see. 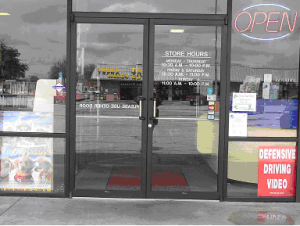 At Academy Door & Repair, we understand the needs of business owners when it comes to their storefront doors and garage doors. That’s why we offer quality commercial garage door service in the Dallas Fort-Worth metro-plex area, that takes care of your points of entry. We take pride in providing the solutions you need when you need them. We’re here to take your call 24/7 and we offer same-day service appointments. Because your garage and storefront doors are the access points to your business, we want to make sure they are secure. So if you’re experiencing any difficulties opening or closing your doors, or you just want someone to check on your commercial door and gate openers before they have a chance to break, we’ll be there. At our garage door repair company, we provide everything you need to keep your overhead and roll-up garage doors working properly. From minor repairs to complete replacements of various parts, we perform each task with strict attention to detail to ensure you get a solution that lasts. When it comes to your storefront doors, a few key components are important—the door closers, pivots, and hinges. If any of these break or don’t function the way they should, we’re happy to take a look and figure out why. Often times, it’s not because of the part itself, but because of a misalignment somewhere on the door. Whatever the cause, we’ll get to the bottom of it. Overhead and roll-up garage doors have a lot more moving parts than a storefront door, which means a lot more can go wrong. However, our commercial garage door service includes the maintenance and repair of panels, springs, cables, and rollers, so you don’t have to worry about a thing. Trust our professionals to inspect and fix any part of your garage door system. Whenever something is wrong with the opener, you’ll know it. Fortunately, our technicians each have more than 15 years of experience repairing and replacing the batteries, solar panels, receivers, and transmitters in door and gate openers. This means you’ll get the fast, dependable solutions you deserve. Keep your business operating efficiently by contacting us today for fast, reliable storefront and garage door service. We proudly serve commercial clients throughout the Dallas Fort-Worth metro-plex area.